This is a post I had written during my initial days of blogging, but the recipe stuck to me. This is not something I grew up eating or a dish that came from my mother’s or grandma’s kitchen. I have heard apparently, Oh Calcutta ( a Bengali restaurant chain in India) does a damn good Kanchalanka Murgi, but sadly enough, I have not had the chance to sample this dish of their’s. Every time we made it to Oh Calcutta, my non-Bengali friends and work colleagues ere more hooked on to sampling the luchi and kosha mangsho ( deep fried puffed flat bread made of all purpose flour as Wikipedia defines it) and braised goat meat) so kanchalanka murgi never really happened. I would hear friends and relatives gushing over Oh Calcutta’s কান্ছা লান্কা মুর্গি তা জে কি ভালো খেতে i আমরা গেলে সব সমায এতাই order করি ( the kanchalanka murgi of Oh Calcutta is just so good we always order this when ever we go ) and I would keep wondering next time, I am to try it. But sadly, that next time never came in the last 10 years since in left the motherland and nor I am kind of resigned to the the fact that it never will. 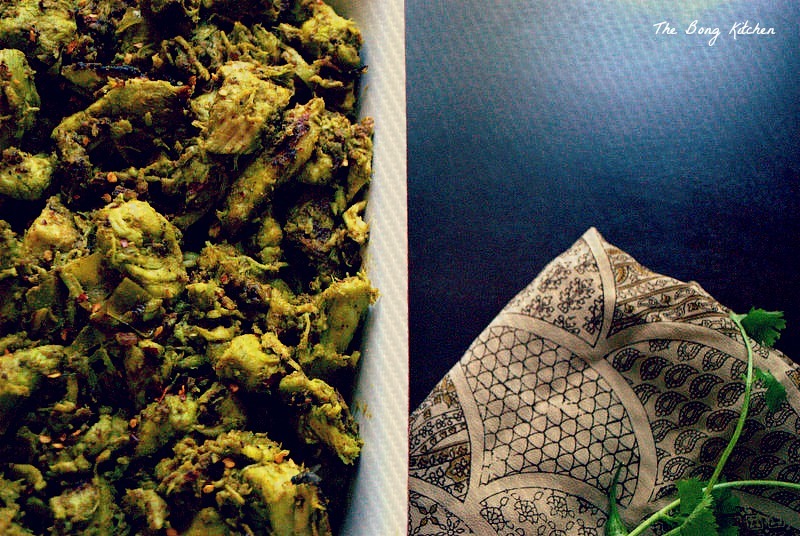 With limited time and multiple destinations to visit Oh Calcutta’s Kanchalanka murgi is a luxury , or a distant dream when we visit India. So now I have come to the point where over the last 3 years I have worked to cook my version of Kanchalanka murgi, I do not know whether it is authentic or not, because i never tried the original one, but given P’s palette and my level of chilies it works fine. It has taken almost 3 years to perfect it, well there is always room for improvement but this my imagination of what the dish would be like. Last time when I published the recipe, I had used chicken on the bones, but this time since I wanted it to be on the drier side, I settled for boneless chicken. Start with about 6-8 green chilies, adjust according to taste, or you could use 4 green chilies and a jalapeno pepper, if you cannot handle the heat of the green chilies. Next clean a big bunch of cilantro or coriander leaves. Now in a blender or grinder. Add the green chilies, cilantro leaves, 2 fat garlic cloves, oil salt and sugar and grind it to a fine paste . You could add the chicken before and then the wet masala but I like my ginger garlic paste well mixed with my onion, choice is yours. 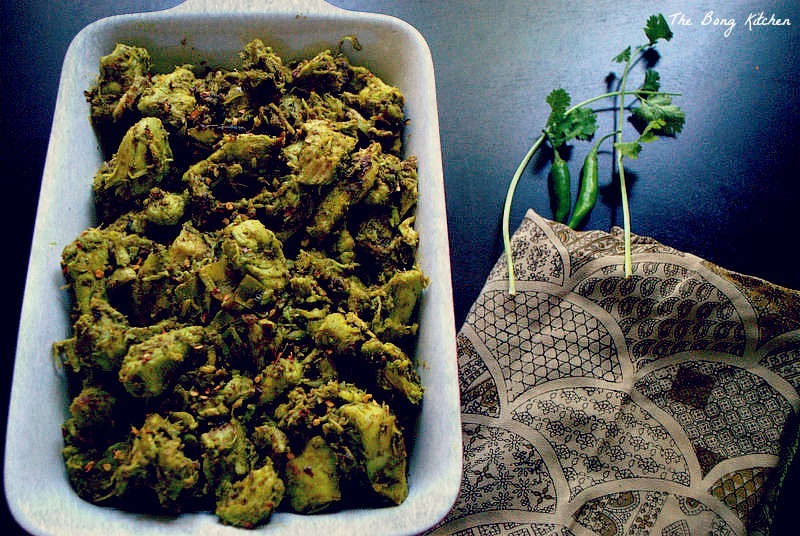 Once the wet masala blends with the onion and starts to emit oil on the sides, add slit green chilies and the chicken, along with the green chili coriander leaves paste, the powdered masala and the salt. Let the chicken cook in medium heat with regular stirs ( if you are using chicken on the bones; this is called kosha is Bengali, cooking dry cooking the meat with spices). You may add ½ a cup of water, if you find the pan drying up otherwise, not required. But if you are using bone less they cook much faster so once the spice coats the meat, cook it on high heat, as the liquid released by the meat dries up, the meat gets cooked . You will see little brown spots here and there on the chicken pieces. Once the chicken is cooked with the masala coats the pieces properly, you might need to check for the spiciness or the heat level and if you find the chicken is too hot and spicy,add a teaspoon full of sugar, mix it well. Garnish with read chili flakes and lime juice. Adjust the chili as per taste and you can cook this dish with mutton or lamb as well. just that the cooking time will vary. 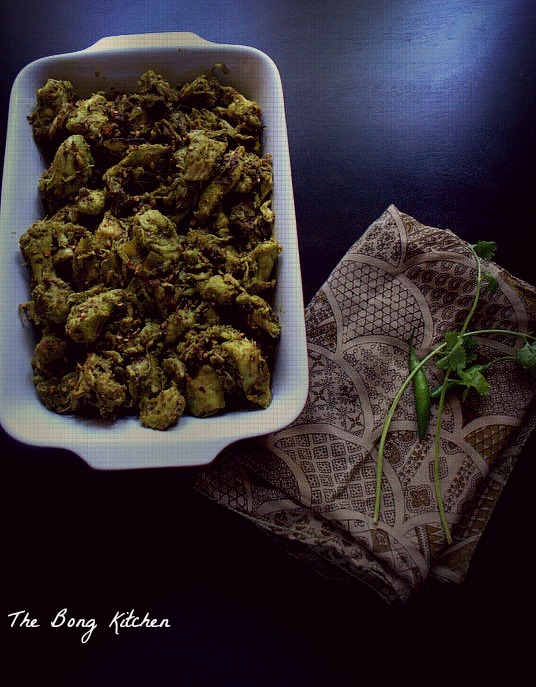 works best with garlic naan or plain chapatti. This is a completely new dish for me but it sounds absolutely delicious! I think I need to try it as soon as possible! I’ve never heard of this dish, but it sounds like something I would love! Thanks for sharing!